Bird song and the comforting sounds of barnyard animals filled the late Spring air as the first fireflies of the evening began to twinkle in the woods of the Wheeler National Wildlife Refuge amid the backwaters of the Tennessee River. 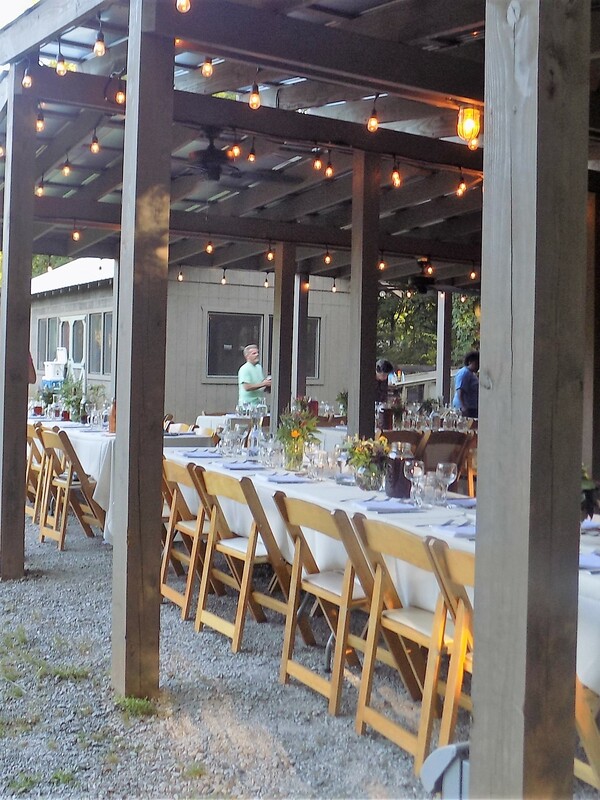 A group was gathered for dinner under the open pavilion at 1818 Farms (www.1818farms.com) in the northwest corner of the quaint and historic town of Mooresville, Alabama (pop. 54), in Limestone County between Huntsville and Decatur. In the wildlife refuge, a canoe glided by in the distance, adding a magical moment to the dinner; I hoped the canoe party looked to their right and saw our gathering beneath the Italian globe lights and flaming torches so that a glimpse of the farm through the trees might add to the magic of their journey at dusk. 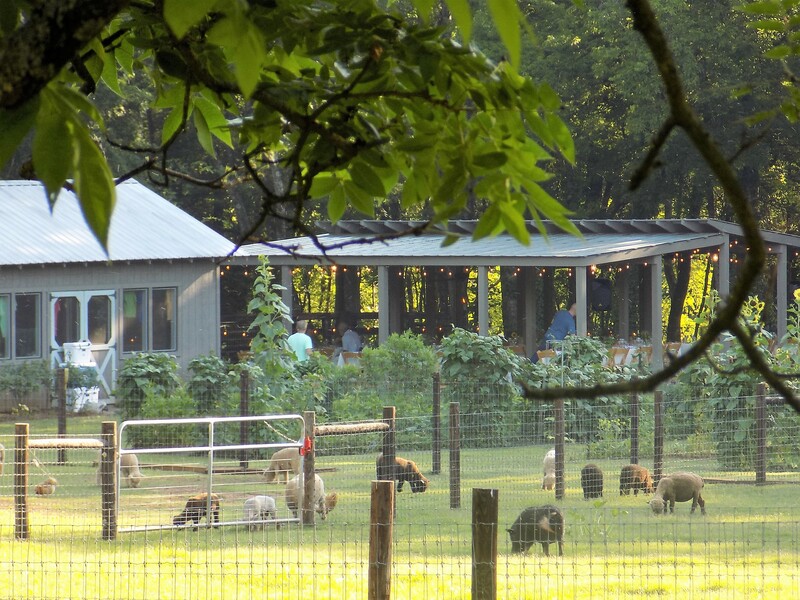 It is the rare weekend when I am not traveling so when my friend Anne contacted me on Thursday to see if I might be interested in attending the 1818 Farms “Farm to Table” dinner on Friday, it was serendipitous that I had already made plans to stay at home. 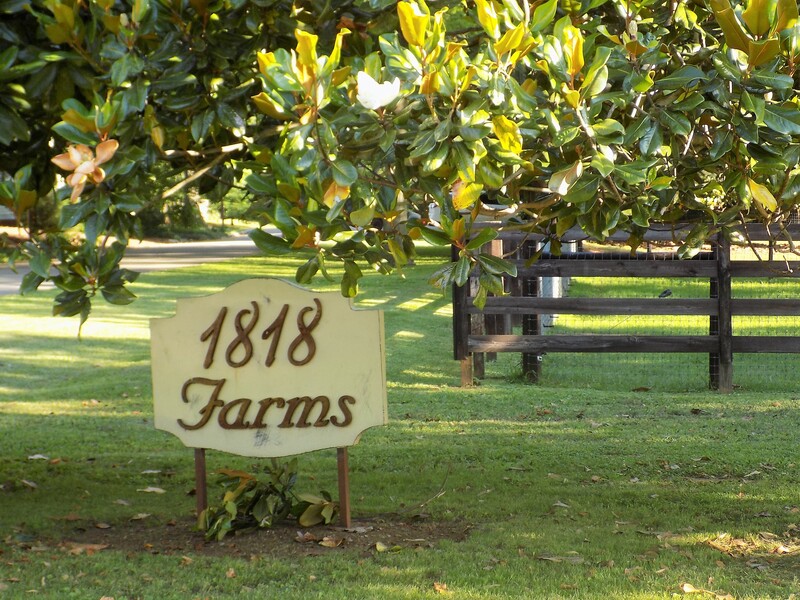 1818 Farms covers three acres in tiny Mooresville. It is owned and lovingly tended by Natasha and Laurence McCrary and their family. A stroll through the property includes visits with chickens, cats and kittens, goats, pigs, sheep, and a Great Pyrenees dog to guard the assorted livestock. All of the animals seem incredibly content. Anne and I visited with three tiny kittens; one was designated to remain on the farm and the McCrarys were looking for good homes for the other two. 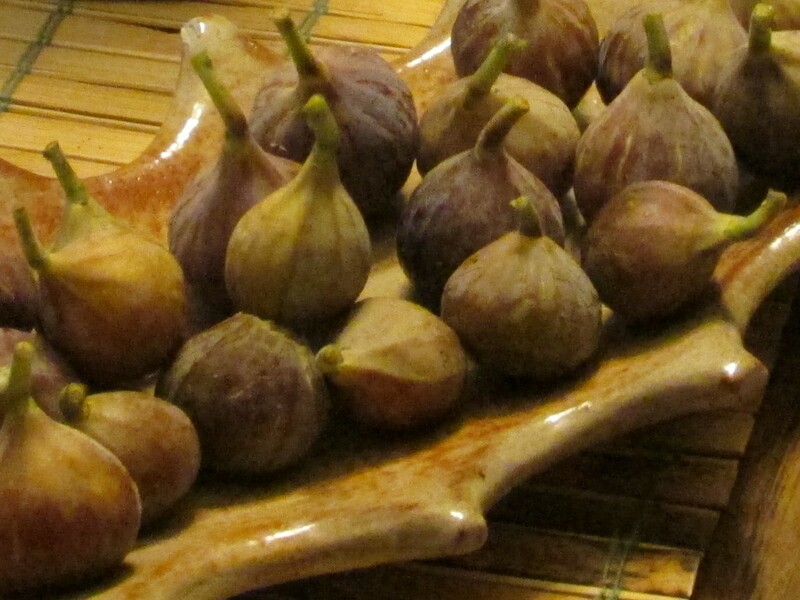 The farm is beautifully curated and a sense of calm begins at the front gate. Everywhere one looks there is a place to rest the eye. 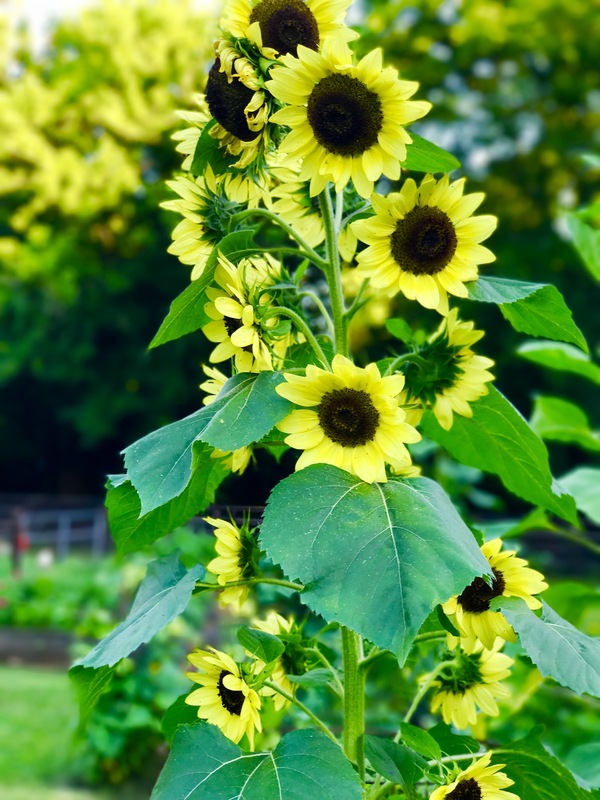 The animals are friendly and accessible, the raised garden beds are lush and filled with bloom and beauty, and the woods and wetlands of the wildlife refuge provide the western boundary beyond the border fence. 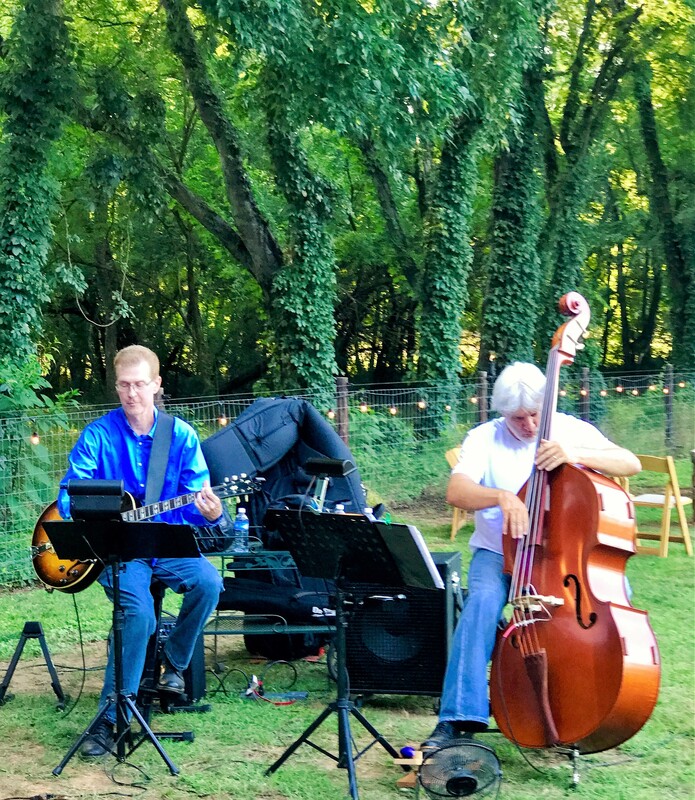 A mellow instrumental duo provided music at the edge of the pavilion throughout the evening. This was my first time to attend one of the 1818 Farms dinners. The meals started a few years ago in collaboration with Chef Jake Reed, the charismatic owner of the charming Albany Bistro, a great neighborhood restaurant in Decatur (www.albanybistro.net). Reed is winding down the Albany Bistro business (which now is open for catering and special events only) and has recently opened the new Table in the Garden eatery (www.tblrestaurant.com) at Huntsville Botanical Gardens. “Chef Jakob” is a committed devotee to the “farm to table” philosophy and every meal I had at Albany Bistro is evidence that he practices what he preaches in creative and dynamic ways. His modern takes on local ingredients are fresh and innovative but he frequently acknowledges the enduring lessons he learned in the kitchens of his mother and grandmother. Passed around hors d’oeuvres included fried green tomatoes with a horseradish sauce, wonton cups with herbed chevre and summer vegetables (the cheese was from Humble Heart Farms www.humbleheartfarms.com in Elkmont, my favorite goat cheese purveyor), and possibly the best sausage balls I have ever tasted. After the assembled guests were seated and the meal was introduced by Natasha and Chef Jakob, the first course of a summer vegetable tart in a puffed pastry crust was presented. It was followed by green bean and potato salad with lemon terragon vinaigrette. The main course was grilled chicken with a balsamic peach glaze, grilled peach, and arugula. For dessert, Chef Jakob presented a bacon and bourbon cupcake. As shocking as a bacon and bourbon cupcake might sound, the result tasted like a fairly traditional cupcake but with interesting notes and hints throughout; I especially liked the crisp bacon crumbles on the top. Chef Jakob created a lovely dinner that was reserved and memorable – unmistakably fresh, local, and seasonal. The presentation and ambience of the event were lovingly executed. By the end of the meal, the twilight had turned to deep darkness and the animals were settling in for the night. Natasha was gathering up provisions for a couple who had decided to adopt one of the kittens and photographs were being taken to commemorate the adoption. 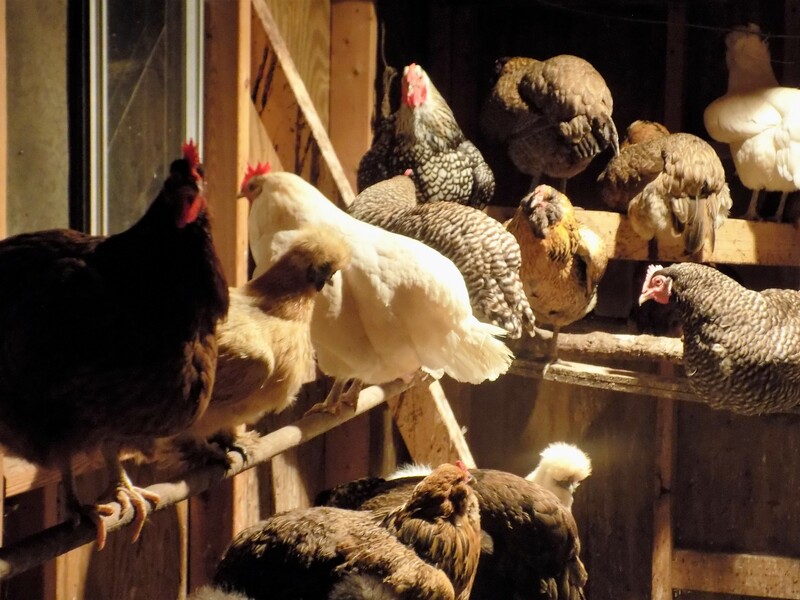 As we stopped to check in on the roosting chickens in their spacious coop, Natasha passed. “They don’t realize how lucky they are,” she said of her menagerie. Indeed, I felt lucky to be able to visit their home for a few hours. During the dinner, I had noticed a full moon beginning to peek through the canopy of trees. Native Americans refer to the first full moon of June as the “strawberry moon.” That strawberry moon shone brightly as I hit the highway for home and a restful sleep. This entry was posted in Farm to Table dinner at 1818 Farms and tagged 1818 Farms, Alabama, Albany Bistro, Chef Jake Reed, Chef Jakob, Farm to Table dining, Humble Heart Farms, Humble Heart goat cheese, Huntsville Botanical Gardens, Mooresville Alabama, Natasha and Laurence McCrary, Table in the Garden on June 11, 2017 by gedwardjourney. Inspired by my recent experience at the “Friends of the Café” dinner helmed by Chef Scott Peacock at the Alabama Chanin factory in Florence – and by the wonderful salad featuring fresh watercress that was served at that meal – I decided to make something that has been on my kitchen to-do list for a while. It’s becoming harder to find reminders of the pre-NASA days here in 21st century Huntsville but the watercress connection has intrigued me ever since I learned about it when I first moved to the area. Although more watercress was distributed from the Madison County area than from any other place in the nation until about 1960, there is only one major distributor of the crop left, in New Market, just north of Huntsville (www.bwqualitygrowers.com). Buoyed by my Alabama Chanin experience, I decided to go on the hunt for fresh watercress – which is no easy task, even in the former watercress capital of the world. After locating fresh watercress at a local market I set about to make a watercress pesto. 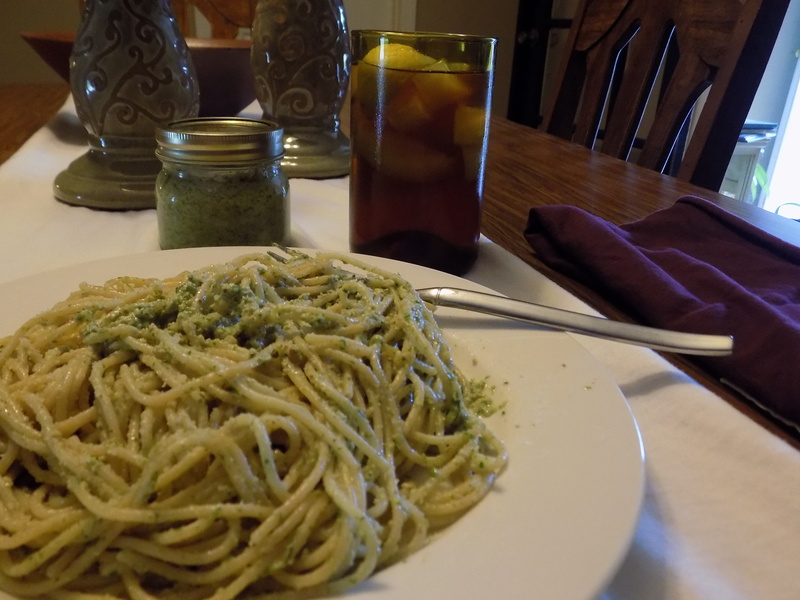 I love pesto and usually keep enough basil plants around the back yard in season to make a batch of basil pesto now and then throughout the summer. I looked at watercress pesto recipes and they mostly seem to follow the basic basil-based recipe, just substituting watercress for basil. For this latest experiment, however, I wanted to use fresh watercress and as many local or Alabama-sourced products as possible. I took down the basil pesto recipe that lives on my refrigerator door and began to doctor it up. In addition to the watercress substitution for basil, I used pecans instead of pine nuts; I used pecan oil instead of olive oil. I kept Parmesan cheese for the texture, but split it with Humble Heart goat cheese from Humble Heart Farms (www.humbleheartfarms.com) just up the road in Elkmont. 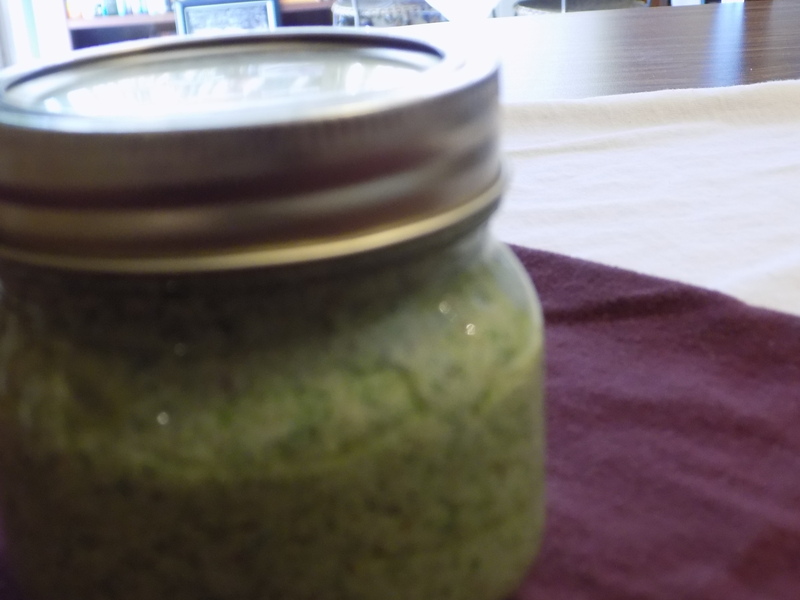 The result was a wonderful fresh pesto with a rich but milder flavor than more traditional basil pesto. Mix and blend ingredients together into a finely textured paste. Yields about 2 cups of pesto. This entry was posted in watercress pesto recipe and tagged Alabama Chanin Friends of the Cafe, B&W Quality Growers, Chef Scott Peacock, Humble Heart Farms, Humble Heart goat cheese, Huntsville Alabama, Madison County Alabama, New Market Alabama, watercress, Watercress Capital of the World, watercress pesto recipe on April 19, 2017 by gedwardjourney. There are many things to love about sultry summer weather and one of them is the opportunity to check out the farmers markets that spring up from spring to fall. When I go to a farmer’s market, I don’t go to linger and socialize; I go to do my business and move on. My typical routine is to make the rounds of all the stalls – making a mental note of what looks good this week – and then to make one more pass to make my purchases and leave. My typical trip to a farmers market takes about fifteen minutes. That is not to say that I am completely antisocial at the market. There are purveyors that I have seen for years now and have come to know and we always catch up with each other. But there are usually other customers to be served and I don’t like to take up too much of their time so we speak, quickly share any news, and promise to see each other next week. Today at a local market there were beginning to be tomatoes. By midsummer the tomatoes will be abundant but now, in late spring, good local tomatoes are just beginning to appear. Today it was clearly time to make the first tomato sandwiches of the season. I have always known tomato sandwiches but I find that I still occasionally get a puzzled look when I mention them to certain people. For those of us who have known them from childhood, there is no standard way to build a tomato sandwich and everybody has evolved a preferred technique over time. My tomato sandwiches are constantly changing based on my tastes and what is available. The essential ingredients for a tomato sandwich are a tomato, bread, and mayonnaise. The rest is up to taste and imagination. I always challenge myself to use only the freshest available local ingredients. 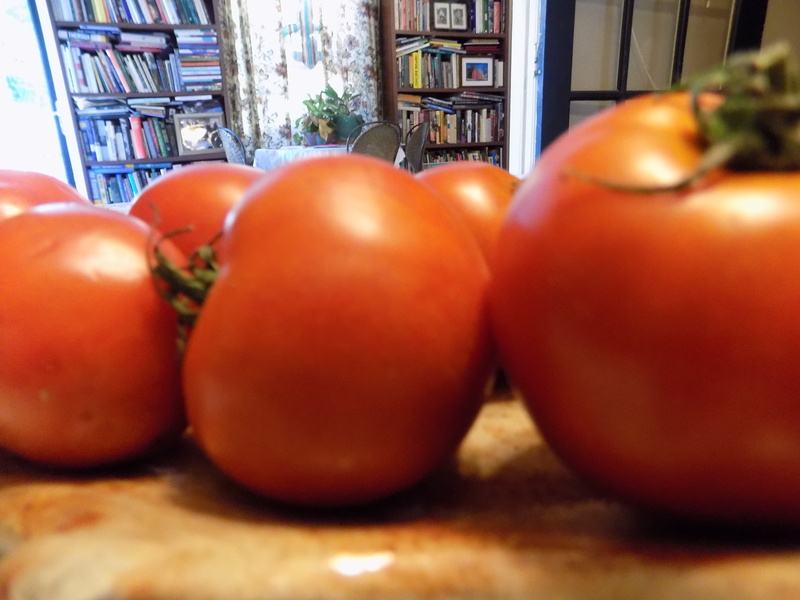 I usually buy larger tomatoes and I look for them to be less ripe so they will last. Today, however, a Cullman County farm was displaying small to medium size ripe red tomatoes that I knew were destined to go home with me and to be the star of my first tomato sandwich of the season. I grabbed a loaf of Mrs. London’s bread that was made this morning. It is a fluffy soft bread that I have been buying for years now. Mrs. London’s bread is about the best I’ve ever tasted. There were sweet red spring onions at another stand and I always buy a container of Humble Heart Farms goat cheese; my flavor of choice this week was the Mediterranean blend. I was ready to go home and make a late afternoon lunch of local ingredients, starring the tomato. As I walked into my back yard, I plucked some basil off the plants growing near the back gate, went into the house, and began to assemble the ingredients for a sandwich. Mrs. London’s bread needs a bit of toasting to take on the load of a soggy tomato sandwich so I started the oven, cut off two generous slices of bread, and toasted it on both sides. 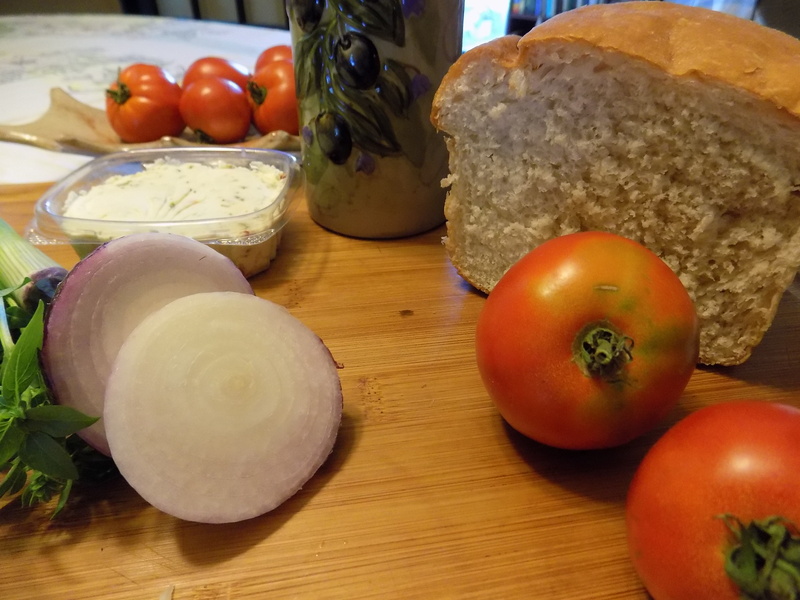 The tomatoes were sliced, the basil leaves were washed and picked, and the red onion was sliced into slivers. When the bread was toasted, I generously slathered mayonnaise (Blue Plate or Duke’s work just fine) and sprinkled some goat cheese on top of the mayonnaise. Basil leaves were layered onto the mayonnaise and goat cheese. 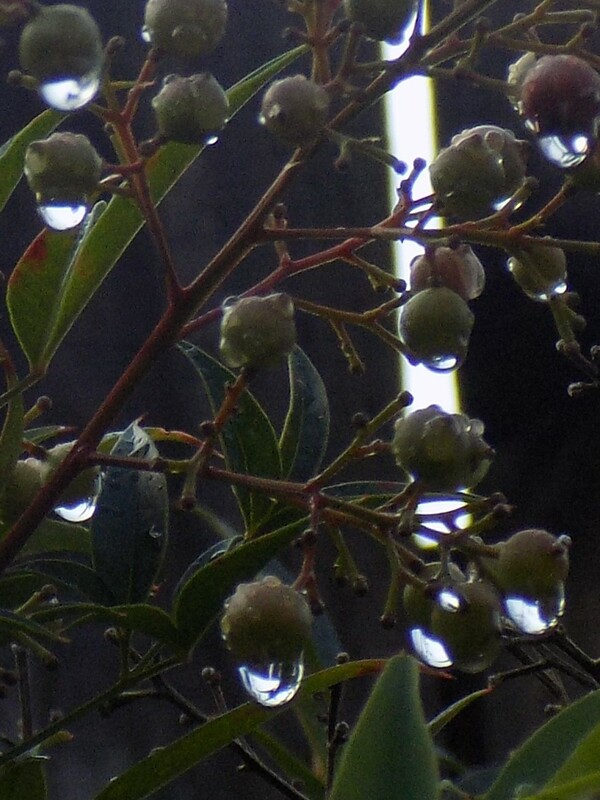 A drop of lemon was squeezed over the basil. Next the onion was spread over the basil. Then slices of tomato were generously layered, completely covering one of the slices of bread, with salt and pepper added at the end. After I pressed the two slices of bread and ingredients together, I drizzled olive oil over the top slice and let the sandwich sit for a few minutes so the ingredients could meld. I ate it with some fresh strawberries from the farmers market and a big glass of iced tea. The first day of summer is still a couple of weeks away, but the first tomato sandwich of the season tastes like summer to me. And, except for the mayonnaise and olive oil, everything I ate came from farms within twenty-five miles of my basil in the back yard. Eat fresh and local this summer. 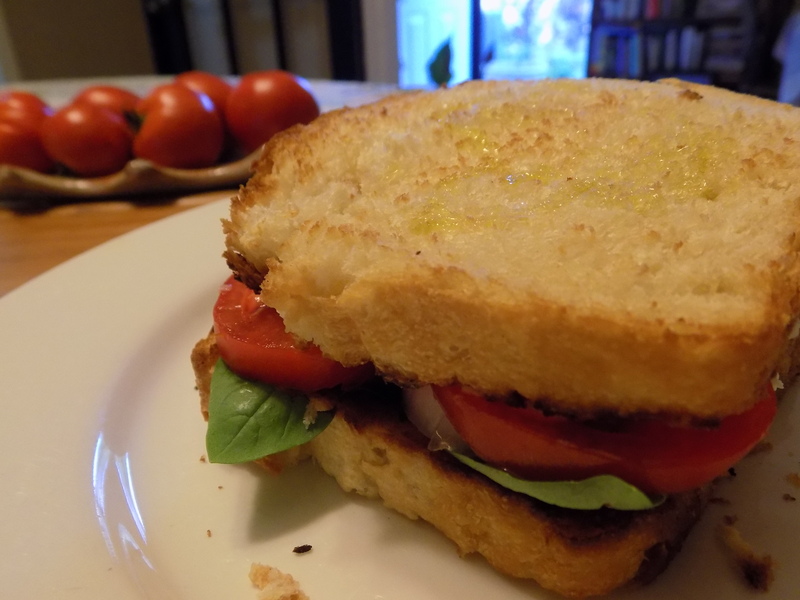 This entry was posted in tomato sandwich and tagged farmers markets, Humble Heart goat cheese, London Bread, tomato sandwiches on June 8, 2016 by gedwardjourney.